Pi Day is observed on March 14 at exactly 1:59 PM and this year, Kumon wants to help Canadian children celebrate Pi Day in a fun and exciting way! Pi Day is a great excuse to engage children in fun math challenges meant to enrich and deepen their understanding of the concept of Pi. 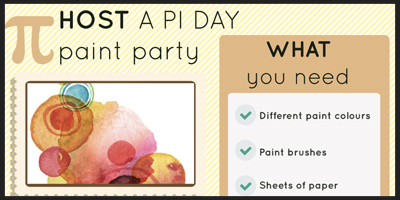 Activities might include investigations of the value of Pi, special Pi projects and parties with pizza or other kinds of "Pi." Kumon Math and Reading Centre Instructors have compiled four fun activities to help families celebrate Pi, while incorporating the self-learning method that Kumon follows. Here are a few fun ways to celebrate Pi Day and have your kids problem-solve and learn on their own at the same time! And when you are done with these activities, why not check out this article we wrote with some crazy facts about Pi that you have never imagined. 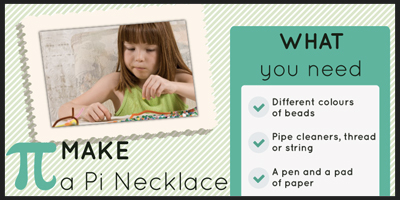 To celebrate Pi Day this year, break out the craft kit and make yourself a fun fashion accessory! Write out as many Pi digits as you can and and colour code each number. Grab different colours of beads and begin to string them onto the thread or a pipe cleaner you select to make your bracelet. Start to place the beads onto the thread in order of Pi’s number sequence and the colours you’ve selected for each digit. 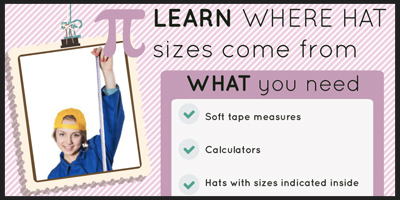 Tie up the thread and wear your new accessory – use it to memorize the digits of Pi! 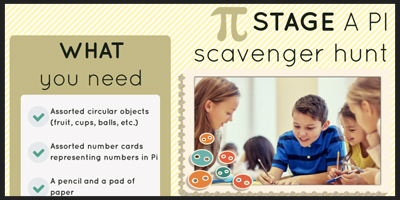 Conduct a Pi Day scavenger hunt by hiding Pi-themed objects around the house. The objects can also represent the numbers of Pi. After the hunt, reward all participants with a delicious prize, like pizza or pie! Come up with a list of the objects kids need to find (provide a few hints just in case). Ask children to hunt for the objects. Word challenges are always a hit with children. Here’s a fun way to enhance and test children’s vocabulary and help them learn new words as well! Challenge children to write down as many words they can think of that include the word “pi” (pizza, pineapple, picture, pie, etc.). 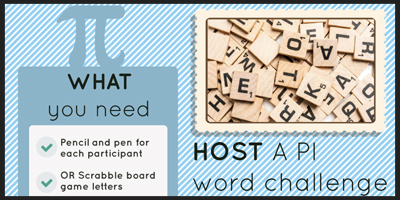 Determine which child has the most number of words written down and offer them a prize! You and your child can have a fun-filled day of painting to celebrate Pi Day by painting your favourite circular objects! This activity would be appropriate for early learners so this may mean painting some flowers, suns, ladybugs and more. Let your children fill their canvass with circles of all sizes – hang it on the fridge for everyone in the family to see! Note: Hat sizes must be related to the circumference of the head. The circumference of an adult’s head usually ranges between 21 and 25 inches. The head’s circumference divided by Pi gives us the hat size. Talk about the results – do the numbers look like they could be hat sizes? Kumon can also help you understand where your child stands academically, figure out their learning priorities and establish the routine needed to succeed. Schedule a parent orientation session to find out more.